Come with us on a whirlwind ride on this classic tour in just 24hrs! That's right! 24hrs to get to Paris from London, via Calais - this itinerary is not for the faint hearted. If you've already completed the standard tour or if this is a box you need to tick off you can be certain of an experience of a lifetime (plus bragging rights). This grand 250 mile route from central London to the Eiffel Tower in Paris is a classic, with an Adventure Café twist. Ride from one exciting European capital to another in just two days! Starting from the iconic London landmark of the Observatory in Greenwich at 2:30pm GMT your leaders will guide you south-east through the suburbs and out into the countryside past Gravesend, Rochester, and Canterbury, before crossing the Kent Downs and dropping to the White Cliffs of Dover and our ferry crossing to the French port of Calais. Our nighttime ride through France takes us through the quiet French countryside, on fast-flowing, yet empty B-roads. As the sun rises we’ll glimpse poppy fields and charming French villages. It’s downhill into Central Paris and we’ll eventually swoop right around the impressive Arc de Triomphe to our finish point at the Place du Trocadero, overlooking the iconic Eiffel Tower. 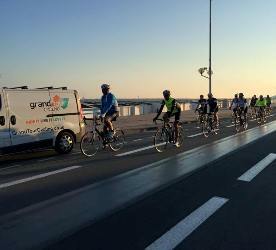 With the challeneg complete, we'll then make our way down the grand Champs Elysees, in the wheel-tracks of Tour de France legends, to our hotel and a well-earned rest! From one capital to the other…. The evening is then yours to enjoy; celebrate in this beautiful and culturally vibrant capital. You are accommodated in Paris and the following day (aching legs permitted!) you are free to sample the delights of city before catching the Eurostar train directly back to London. Your bike will have a head start on this journey and you will be reunited back in London. Due to the extreme nature of this challenge, please note that this trip is not for beginner cyclists. 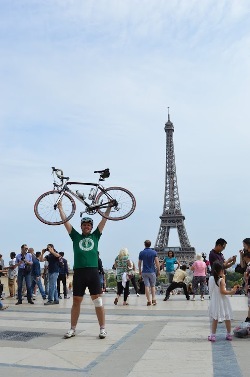 If this will be your first 24hr ride, please consider our standard 24hr London to Paris itinerary here. Before signing up for this ride we will need to see proof of previous experience in the form of Strava/GPS files. 14:30 - Depart ride on the chime of 3pm from Big Ben, We're off... we travel south-east into the countryside past Sevenoaks, Crowborough and Lewes, then down to the Sussex coast arriving at Newhaven for 19:30. Now the challenge is on! We ride through the night, before breaking through the darkness into the new day, with Paris looming on the horizon - try to take in the beautiful countryside as we blast towards the French Capital! We have to make the most of the open roads before entering the outer reaches of the city and of course the Paris traffic. We will stop for lunch on the outskirts of the city. As we near the city centre you will be greeted by all of Paris famous sites such as the Arc De Triomph and the Eiffel Tower. Congratulations you have reached your destination! After a lie-in, you will have the morning to explore Paris before an early afternoon Eurostar return to London. We will transfer your bike back for you in the support vehicle, meeting you at St Pancras to hand your bike over, ready for your next adventure! We will be staying in Twin or Triple rooms at our accommodation. If you require a single room please contact us for the single room supplementary fee for your trip. Transport to/from London start/finish points, Lunches and dinners. Pre Event Accommodation in London. By nature all activities contain a an element of risk. Your leader will be first aid qualified and will carry the appropriate safety kit for the activity. Safety equipment carried will be appropriate to trip. The leader's primary role is to ensure your safety, but it is your responsibility to listen to their guidance and instructions. This trip is of an extremely strenuous nature. Both you and a significant other will need to sign a disclaimer stating that you understand what you are signing up for prior to the event. Expect warm weather but possibly rainshowers. Expect cool temperatures riding through the small hours into the morning. Plan for these conditions, and if we encounter anything more benign, then that will be a bonus for us!